Reports of the death of line printers have been greatly exaggerated, to paraphrase Mark Twain. In their early days, line printers tore through reams of tracked paper and burned out hundreds of lines of text per minute. They gradually evolved into smaller, quieter consumers of standard-sized paper. A shrieking line printer seems like a Jurassic dinosaur next to a streamlined laser printer in today's office. months on one paper load. But several vendors continue to make line printers, with Tally Printer Corp. leading the charge. Tally's T6215 is a direct descendant of the old line printers and has many of their characteristics: It's large and stands more than 40 inches high and 31 inches long. It came up to my waist. When the case is open during printing, the shrieking noise is deafening. Tally has done a good job of soundproofing the inside of the metal case with noise-absorbing foam material. With the case closed, the noise level drops tremendously, to about 52 decibels, or about the same level as an average laser printer. The printer uses standard track-feed paper, which is cheaper than the letter-size fed into laser and ink-jet printers. As the paper runs through the printer, it piles up at the back, where a passive stacking system keeps it from spilling over. Several long copper chains hang down the back of the case. The chains put enough weight on the paper to make it drop down and stack nicely inside the case. In my tests, the passive stacking arrangement malfunctioned only twice in 3,000 pages. There was a slight paper mangle in the middle of a large document. Line printer dinosaurs have survived because of their speed and capacity, and in these areas the T6215 does well. 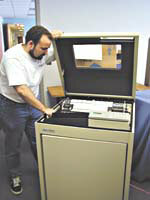 The printer pumps out pages at a top speed of 1,500 lines per minute for text-only documents at standard resolution. My tests measured full pages of text emerging at an average of 20 per minute. That's fast, though slower than some network laser printers the GCN Lab has tested. The T6215's paper size is larger at 17 inches across, however, so each sheet bears more data. For small jobs, the T6215 does not outperform most laser printers, but for large jobs, it's hard to beat. You could load a box of 10,000 sheets into the bottom of the unit and not have to worry about running out for a long time. Also, the track feed proved almost 100 percent reliable, not once derailing the paper in extensive tests. If you work in an office that prints thousand-page documents, the T6215 is a great fire-up-and-forget workhorse. Loaded with labels, it could blow through a large mailing list in an afternoon. The ribbon is self-inking, so the first page of a document looks as good as page 2,000. I could not detect any degradation of quality over time. Eventually the hammer strikes will make the ribbon fall apart, but on long-life ribbons this happens only after 250 million characters have been struck. The lab staff did not manage to kill a ribbon in our tests. The printer did have some problems with standard applications that other printers breezed through, such as documents in Adobe Portable Document Format. It took a Tally engineer several hours to configure the printer to print .pdf files properly, and even then the quality was not close to that of a laser. In an era when a network printer must be the office jack-of-all-trades, this is a factor to consider. Tally makes a specialized printer rather than a one-size-fits-all system for an office. The T6215 demonstrates the Darwinian survival of 1970s-era line impact dot-matrix technology in an industry in which anything a few weeks old is obsolete. Offices with large mailing lists or data centers with huge reports will find the value of a line printer far outweighs the high initial cost of this evolved dinosaur.